Through “Empowering Berna” Project, Merck aims to empower infertile women economically and socially across Africa. Jackline Mwende was brutally slashed at her home in Masii, Machakos County, Kenya for failing to conceive after seven years of marriage. 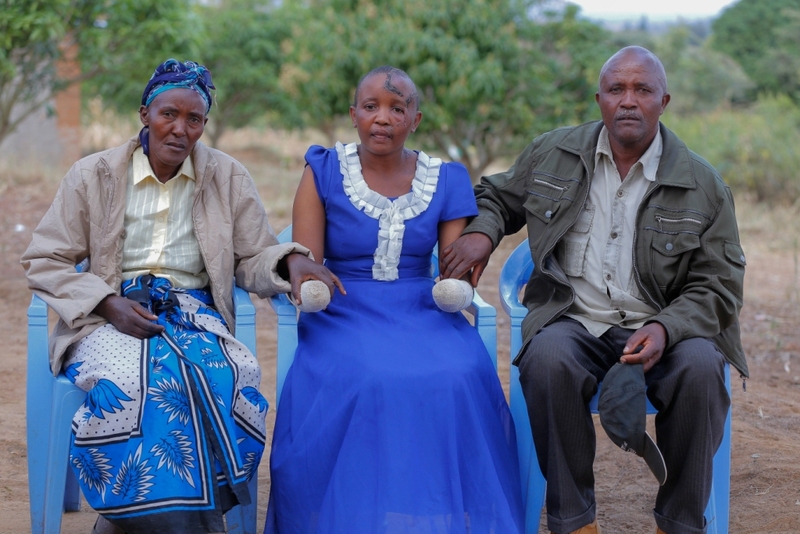 “Jackline Mwende, a young woman of 27 years from Machakos County in Kenya whose both hands were chopped off – not by thieves but by her own husband for failing to bear children. It is so shocking that someone would go to such an extent to batter his own wife and leave her nearly dead. Infertility should never be a reason to separate, hurt or kill your partner. There are so many options out there available to manage infertility” said Hon. Joyce Lay, Member of Parliament and the Ambassador for ‘Merck More than a Mother’ in Kenya. “Through -Empowering Berna- project, Merck will support Jackline Mwende throughout the rest of her life to empower and enable her to become an independent productive member in society. ‘Merck More than a Mother’ initiative will provide Mwende with a monthly income of $250, then will establish a business for her in which she will be able to generate a sustainable monthly income of not less than $250. At the same time Merck will provide her with the needed physical and physiological rehabilitation to enable her to support herself and stand on her own two feet despite the challenge of her brutal disability that was caused by the stigma of infertility – even though her husband is the one who was found with the infertility problem, yet she is still the one who bore the devastating consequences of the public stigma associated with it.” Said Rasha Kelej – Chief Social Officer, Merck Healthcare. “Mwende didn’t deserve what she went through and especially that her husband is the one who was found with the infertility problem and not her. Society, government and all stakeholders need to continue to join hands with Merck in their campaign to encourage the acceptance people live with infertility because the stigma associated with infertility puts pressure on them to a point where they do crazy and criminal things. We need to know that it’s a shared responsibility, not just for the couple but for the society too,” Hon. Joyce Lay added. “This terrible violence Mwende suffered emphasized the significance of ‘Merck More than a Mother’ initiative for Africa. ‘Merck More than a Mother’ will continue working closely with partners to create a culture shift and to empower infertile women economically and socially through “Empowering Berna” Project to ensure no other woman in Africa should ever go through such violence, humiliation or misery again,” Rasha Kelej – Chief Social Officer, Merck Healthcare emphasized. About “Merck more than a Mother” initiative: In many cultures, childless women still suffer discrimination, stigma and ostracism. Infertility can transform from an acute, private distress into a harsh public stigma with complex and devastating consequences. An inability to have a child or to become pregnant can result in being greatly isolated, disinherited or assaulted. This may result in divorce or physical and psychological violence. “Merck More than a Mother” initiative aims to define interventions to reduce the stigma and social suffering of infertile women, empower them and raise awareness about male infertility and the necessity for a team approach to family building among couples across the continent. According to the World Health Organization (WHO), lower levels of development are thought to be associated with higher levels of non-genetic and preventable causes of infertility. For instance, poor nutrition, untreated sexually transmitted infections (STIs), unsafe abortion, consequences of infections caused by the practice of female genital mutilation (FGM) or child marriage, exposure to smoking, leaded petrol and other environmental pollutants can lead to infertility. About “Empowering Berna” Project “It is very important to empower infertile women through improving access to awareness, health and change of mind-set so they can bear children as part of their human rights. In case they can no longer be treated, ‘Empowering Berna’ project will contribute towards empowering and training them to establish their own small business so that they can be independent and re-build their own lives, a woman is more than a mother, ‘Empowering Berna’ initiative will prove this every day.” Rasha Kelej, Chief Social Officer of Merck Healthcare. Jackline Mwende Munywoki from Machakos, Kenya is the recent victim of the brutal physical and psychological assault that women in Africa face as a result of being infertile and are unable to bear children even when they are not the ones with the problem. She recently had her hands chopped off by her husband of five years for not conceiving and giving birth. Jackline Mwende who says she had a stable upbringing, in a loving home where she grew up with six of her siblings narrates how she came to lose her hands because of not being able to have children in her marriage. Her parents did their best to take her to school from kindergarten up to primary school class 8. Upon completing her studies, Mwende enrolled in a tailoring school where she learnt how to sew and make garments. It was at this school that she met and fell in love with Stephen Ngila – her husband. They got married in 2011. “A year into the marriage and with no child, I began to notice changes in my husband. He had picked up bad habits such as drinking alcohol and started to become abusive. It was at this point that I confided in my parents, who were also wondering why I had not become pregnant yet. They advised me to leave the marriage since it was becoming abusive,” Mwende narrates. “As an avid church goer, I also sought advice from my pastor,” she adds. Even at the start of the violence in the marriage, both she and Ngila would go to seek counseling from him. The pastor advised both of them to live in harmony; however, Ngila ignored. The pastor advised her to stay with her husband, of which she tried as long as she could. Both Mwende and Ngila went to hospital for diagnosis. It was confirmed that Ngila- the husband- was infertile. “I constantly pleaded with Ngila to go to hospital to seek a treatment for his infertility, but he always made up excuses. He would say that he would go after work but never did,” she says sadly. Their marriage continued to get strained and the abuse increased because Mwende had not borne a child. On several occasions, the couple wound up at the police station due to their fights and arguments. The couple eventually separated and Mwende set up her own small shop from where she was getting some income to support herself and even her parents. On August 1st 2016 in the evening, Mwende was peacefully eating her dinner when she heard a knock on the door. When she went to open the door, Ngina who was drunk started to attack her with a panga (machete) and cut off her left hand. In shock, Mwende collapsed on the floor while Ngina continued to hit her with the machete on her face, and cut off her other right hand. “Today you have decided to kill me?” Mwende recalls screaming at Ngila. His intent was to kill her, but she continued screaming until her neighbors came to her rescue and Ngila escaped. She was taken to the hospital for treatment and she is currently on medication and nursing her wounds – which will always be a constant reminder that the reason she is in the state she is now is because she never bore any children. 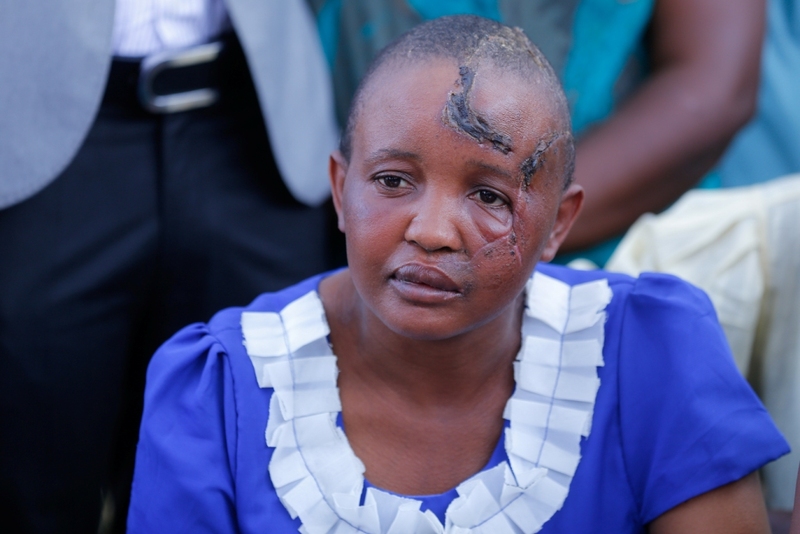 “If it is God’s will that I do not have a child, I am content with this,” Mwende bravely said. She is hopeful for her future and grateful for all the support the community has given her. She would not like any other couple to go through what she has experienced and advises couples to seek solutions together if they cannot have a child, and visit the hospital for check-ups regularly.